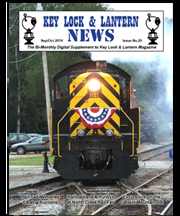 Key Lock & Lantern, Inc. is a non-profit 501(c)(3) organization dedicated to the preservation of railroad history & memorabilia. 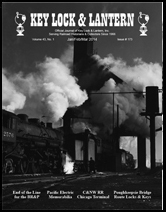 Our mission is to gather and publish information about transportation history, and to support the conservation of all types of railroadiana, including historical artifacts, photos, records, and stories. 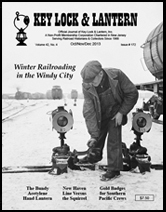 Members receive a quarterly magazine with detailed articles about railroad artifacts, history, and collecting; a bi-monthly e-mail newsletter; and an invitation to participate in the group's annual convention. 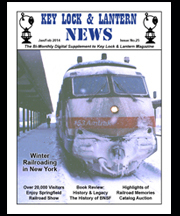 Founded in 1966, Key, Lock & Lantern has grown from its beginning as a two page newsletter for railroadiana collectors to become a valuable and well-respected resource for railroad historians and preservationists. Click Here for a brief history of the organization, and some of the people who have been involved with it. 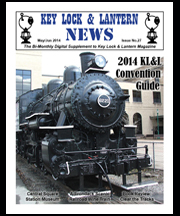 Key, Lock & Lantern has been serving railroad historians for over forty years, and our organization continues to grow. 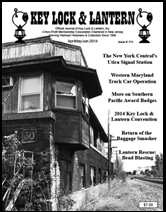 Anyone with an interest in transportation history and collecting will benefit from membership in Key, Lock & Lantern. Our membership period begins in July of each year. New applications received prior to March 31st will be applied to the current membership period, and the member will receive all magazines published since the previous July. Applications received after March 31st will be applied to the next membership period, and the member will receive magazines beginning in July. 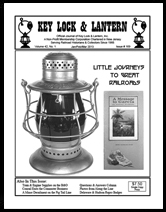 A membership in Key, Lock & Lantern always entitles you to four issues of the quarterly magazine. There are two ways to join or renew your membership in KL&L: A membership form may be printed by Clicking Here, and mailing in with your dues payment. Or you may join or renew online using a credit card or funds in your Paypal account. By clicking on one of the "Add to Cart" buttons below, you will be taken to the secure Paypal site, where you can enter payment information or log into your Paypal account.